Wild Dog, vol. 3, no. 21 (March 1, 1966). In many respects—name, form, and content—Wild Dog boldly embodies much of what we identify as the “mimeo revolution.” Preceded in Pocatello by A Pamphlet, Wild Dog, which joined the mimeograph revolution in April 1963, was the brainchild of Edward Dorn, who was familiar with the emergence of divergent American writing through his association with Black Mountain College, where he had studied under Charles Olson and Robert Creeley. The literary direction that Dorn brought to Wild Dog encompassed writing from diverse sources including, but not limited to, writers associated with The Black Mountain Review, the San Francisco Renaissance, the Beat generation, the New York School, and certain “hip” European and South American publications and poets. In its three-year history, Wild Dog moved from Pocatello, Idaho, to Salt Lake City, Utah, before ending its existence with number 21 of volume 3 in March of 1966, in San Francisco. 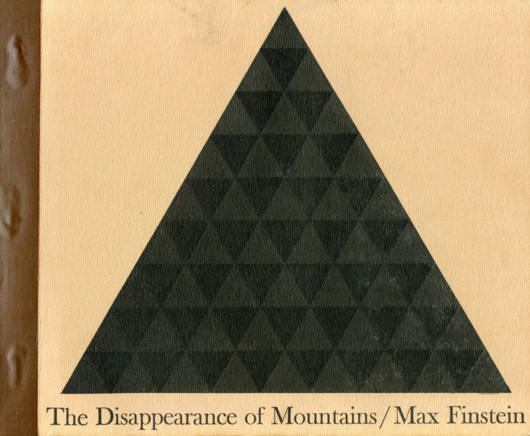 Max Finstein, The Disappearance of Mountains (1966). Cover and illustrations by Jorge Fick. In January 1966, Wild Dog published a book of poems, The Disappearance of Mountains by Max Finstein. Wild Dog had several editors in its brief history. While in Pocatello, John Hoopes edited the first issue with Ed Dorn and then edited number 2 with Geoffrey Dunbar and numbers 3 and 4 with Drew Wagnon. Drew Wagnon joined Hoopes for number 5 and stayed with the magazine through its final issue. He joined Gino Clays (Sky) in Salt Lake City for number 10 and later went to San Francisco with Clays to edit numbers 11 through 18. A double issue, 19/20, and the last issue were edited by Wagnon and his wife, Terry. During the period of the magazine’s existence, there were also several guest editors. Some of the writers and poets who submitted original manuscripts to Wild Dog were LeRoi Jones, Douglas Woolf, Robert Kelly, Larry Eigner, Fielding Dawson, Charles Olson, Denise Levertov, Louis Zukofsky, Robert Creeley, Diane Wakoski, Stan Brakhage, and Joanne Kyger. Finstein, Max. The Disappearance of Mountains: Poems 1960–1963. 1966. Wild Dog, vol. 1, no. 6 (February 29, 1964).